A recent browse through some 20 television channels broadcast in Taipei, Taiwan, reveals five or six of them airing Korean dramas or comedy programs. "Because the Taiwanese people love Korean programs so much, a company like Eastern Television can earn a great deal through an exclusive contract with Korea's SBS," said Han Hwa-joon, head of the Taipei office of the Korea Tourism Organization. "They air the same programs two or three times on their own channel, and then transfer the broadcast rights to smaller cable companies." 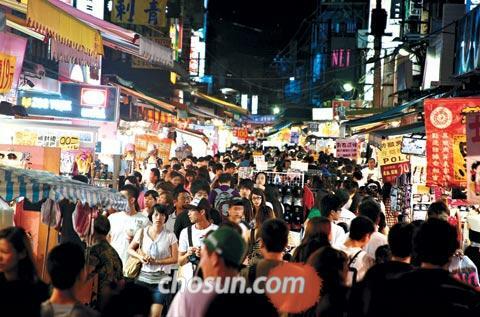 The Shilin Night Market in Taipei is packed with visitors on Thursday. The market is one of the most popular spots among visitors from the mainland China. Despite the immense popularity of Korean pop culture in Taiwan, Korean goods do not sell so well there. "The Taiwanese felt very betrayed after Korea severed diplomatic ties with Taiwan and reestablished ties with China in 1992, because the people of Taiwan had seen Korea as an ally in the fight against Communism," an official at the Korean trade office in Taipei explained. "Now because the two countries have similar export-oriented economies and focus on the same business sectors, the Taiwanese see Korea as a great rival, and think that losing to Korea would be the end of Taiwan." Taiwan's population of 26 million (as of August 2008) is about half that of Korea, and its area of 27,000 sq.km makes it a bit larger than North and South Gyeongsang provinces combined. Its per capita GDP in 2008 was US$18,300, slightly lower than Korea's $19,600, while the import and export volumes of the two are head to head, each the fifth or sixth largest in the world.